Tiny hamlets dot the Himalayan foothills of Arunachal Pradesh. Some lie along the winding roads while a large number are accessible only by foot paths taking as long as 3-5 days to reach. These hamlets are few and far between and the percentage of land occupied by all the villages cumulatively will probably not cover more than 5% of the land available. The rest is covered by thick forests. Forests that sustain the small population. The life philosophy of the people therefore, integrates their own lives with their surroundings and their model for life sustenance reflects their philosophy. They conduct ‘jhoom’ farming to grow some of their grain, they hunt for food, they cut deadwood for fuel and housing and they weave what the clothing they need. They are hunters, gatherers, weavers, farmers. On the drive from Khonsa to Pasighat to Along to Daporijo to Ziro, in the afternoons, as I crossed hamlets, I’d come across women sitting in their porches and weaving on back-strap looms. In the evenings as I’d approach a village I’d see men and women returning from the forest, their rattan head-strap back-baskets filled with millet or logs or other products from the forest. And all through the day but more so after dark, I’d see solo men and solo women with rifles going out to acquire the next meal for their families. The new world is changing lives everywhere but it is refreshing to see a world that is moving at a leisurely pace and is in no hurry to catch up with anyone else. Am Apatani shawl acquired directly from the weaver has been added to the wovensouls collection. Please click here to view it. 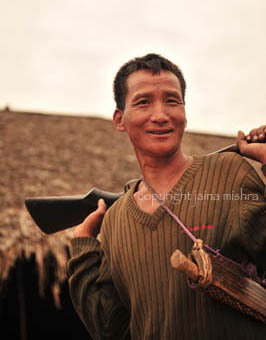 This entry was posted on January 5, 2012 by wovensouls in Culture Kaleidoscope and tagged art, art photography, Arunachal, Arunachal Pradesh, Asia, back strap, cloth, cultural, cultural photography, culture, Daporijo, Environment, essay, ethnic, forest, gatherer, gun, himalaya, himalayas, hunt, hunter, india, jungle, Khonsa, loom, North East, North East India, photo, photographer, Photography, rifle, textile, textile art, tour, travel, travelogue, Tribal, tribe, warp, weaver, weaving, weft, wovensouls, Ziro.